When Sonic the Hedgehog was ten years old, he infiltrated a group of Mobians that had been taken prisoner by Dr. Robotnik and were being taken to a high security prison/research facility. Ray was one of the unlucky inmates, and his timid nature was quite evident, though it didn't stop him from being courteous, gave up his seat to a girl. He soon made friends with Mighty the Armadillo and the young Sonic, the latter of whom boasted that he would soon have them all free again. Upon arriving at the prison, the two came to the aid of Fiona Fox, another prisoner who was targeted by the Robian warden for Robotnik's experimentation. For all his fear, Ray battled valiantly, stopping only when all three of them were targeted by laser weapons. After, Mighty and Ray in separate cages, while Fiona was taken to Robotnik himself. Liberated by Sonic and Mighty, he joined them in attacking Robotnik's lab, making his way towards a machine that was copying Fiona Fox in order to create an Auto Automaton. Ray grabbed the Power Stone fueling the machine and was then hit by an energy beam from a SWATbot, but instead of dying was trapped in some sort of time warp between Zones. Sonic dashed to get him, but he didn't succeed. Mighty, very upset over the whole thing, tore apart the facility but Sonic told Mighty to never give up hope. For years Mighty thought his friend was dead, only to return years later with Fiona and Nic the Weasel to find Ray alive and well. Ray was then freed from the Zone convergence by a shot from Nic's blaster pistol, and happily reunited with Mighty he accompanied him to Angel Island and became a member of the Chaotix. Ray accompanied the Chaotix on numerous missions as time went on, helping them face numerous foes. Along with the other residents of Angel Island, he was sent to the Twilight Zone by the Dark Legion's Quantum Beam, only to be brought back later by Chaos Knuckles. Following Knuckles' death, Ray was among those who joined in during the massive battle against the Xorda, during which Knuckles made his return and Sonic seemingly took his place. Ray attended Sonic's funeral before siding with the other Chaotix in remaining on Mobius' surface to do battle with Dr. Eggman and put an end to his threat once and for all. Happily, Sonic returned a year later, having been in space due to the Xorda's Quantum Dial exploding, and Ray was one of many in attendance at Mina Mongoose's concert welcoming him home. When word reached the Chaotix of Knuckles' father Locke being imprisoned on Angel Island by the Dingoes, who with Eggman's aid had overthrown the Echidnas some time previously, Ray was with the Chaotix as they stormed the island to save the Guardian. Later, Ray bravely battled alongside his friends as they faced the sorcerers Mammoth Mogul and Ixis Naugus and their minions the Destructix and Arachne for possession of the Sword of Acorns and Crown of Acorns, the last remnants of the Source of All. He and Mighty also interviewed Fiona in order to gain intelligence on Rouge the Bat after she arrived in Knothole seeking protection from Dr. Finitevus, the mad Echidna she had briefly joined forces with and then left. The duo also worked together with Espio the Chameleon as he infiltrated the Golden Hive Colony, former home of Chaotix members Charmy Bee and Saffron, to determine what had become of its inhabitants. A much more pleasant duty found him attending the wedding of Freedom Fighters Bunnie Rabbot and Antoine D'Coolette. Unfortunately, the happy atmosphere brought about by that event was cut short as Dr. Eggman launched a massive assault on Knothole using his Egg Fleet while dispatching his nephew Snively Kintobor to attack Freedom HQ, the base the Freedom Fighters and Chaotix shared. 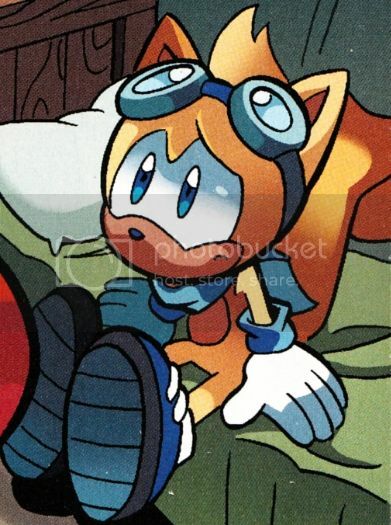 Ray was amongst the many taken prisoner by Snively and transported to the Egg Grape Chamber, where he and the other inhabitants of Knothole were then saved by Sonic, Tails, Knuckles, Amy Rose, and the computer NICOLE, who also arranged for them all to be transported to the city of New Mobotropolis. When word reached the city of the rise of a new Enerjak, an old foe of the Chaotix, Ray accompanied his friends as they stormed the King Frederick Airfield in a bid to reach Angel Island and aid a missing Knuckles. Convinced to remain in the city by Sally Acorn, they were then faced with a horrible revelation as the new Enerjak unmasked himself, revealing his identity as a brainwashed Knuckles. Ray was among the many who charged Enerjak in an effort to stop him, only to be thwarted by his immense powers. After the battle between Enerjak and Super Sonic, Ray returned to Angel Island with the other Chaotix to build a bridge between Angel Island and the new Shrine Island, now the resting place of the Master Emerald. When Sonic and the Chaotix attacked the ravaged New Megaopolis, Ray, Charmy and Saffron were responsible for setting explosives in one of Eggman's main satellite towers which was his primary means of communication with other sections of Mobius, while the others attacked the Dark Egg Legion. The three found themselves cornered when the Dark Egg Legion ended up retreating to their location. However, when the rest of the Chaotix continued to battle against them and force the Dark Egg Legion to retreat further, Ray, Charmy and Saffron detonated the bombs, destroying the communications relay. Ray later played a key role in the final push against the crumbling Eggman Empire. After flanking the Dark Egg Legion with the rest of the Chaotix, he, Charmy and Saffron planted Tails' Neuralizing Mines on the Egg Phoenix. After Sonic jumped off the ship, Ray caught him and lowered him to the ground safely, both witnessing the Egg Phoenix crash when the mines were activated.